When We Last Spoke was such a delightful read. The story takes you from present and dives into the past. Sharing the time when two little girls came to live with their grandparents. Written from the one sister's perspective it is a sweet tale of love between family. I loved the parts set in the past, I feel like everyone could relate to having grandparents like Juliet and Evangeline did. Their lives were filled with events and food, things that stick out to a young child. I personally loved the great-grandmother in this story - her antics were things I could see my family sitting around reminiscing about at the dinner table. 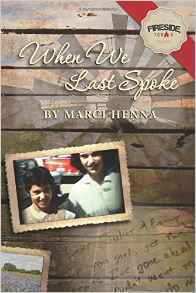 Marci Henna writes in such a way that you wish you had been part of the family. You can just see that kitchen with the food cooking and the love all around the family. Now I did love this book but the ending left a bit to be desired for me. The past was so full that the present fell a little flat. It didn't make me want to stop reading in fact it only makes me hope there will be more. I mostly wish that it was a lot longer so I could have learned more about the past - the teen years rather than the glimpses we got of those in the present. However the story did work how it was written and I did enjoy it quite a bit. Humor, heartbreak, and triumph are served with whipped cream and lots of local nuts in this heartwarming tale of family, friendship, and forgiveness in Fireside, Texas. Does the tremendous love that marked Walt and Ruby's lives still have the power to renew their sisterhood and help them find their place in the world? I just called them Grandpa and Grandma. I call mine nana and papa.